Recently there have been even more disturbing events relating to the judiciary reported in the press. We have also witnessed the unprecedented act of a former Court of Appeal judge writing in his post-retirement book of erroneous and questionable judgements delivered by our higher courts in a chapter under the heading “When Justice is Not Administered According to Law”. There are other serious criticisms. I am driven nostalgically to look back to a time when our Judiciary was the pride of the region, and our neighbours spoke admiringly of our legal system. We were then second to none and the judgements of our courts were quoted confidently in other common law jurisdictions. As Tun Suffian, a former Lord President of the then Federal Court, said of the local judges who took over from the expatriate judges after Merdeka that the transformation was without “any reduction in standards”. Nothing destroys more the confidence the general public, or the business community has in the judiciary than the belief that the judge was biased when he decided a case, or that the judge would not be independent where powerful individuals or corporations are the litigants before him. The Prime Minister was a no-show this morning at the opening of the much anticipated Malaysian Law Conference. It was either bad time-management by his office, a public snub, or perhaps he didn’t fancy facing hundreds of lawyers on a Monday morning. He is said to be hosting the Conference dinner tonight. 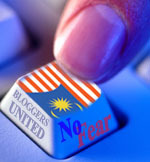 Posted by elizabethwong in "We can do better", Current Affairs, Democracy, Human Rights, Malaysia, Note2Self, Politics. My newspaper delivery guy did an extraordinary thing – he delivered the New Sunday Times early yesterday at 8.00 am (usually he takes his time on Sundays and drops it off around noon), knowing full well I would be keen to read the headline story. So Sunday morning was well spent, laughing in bed and playing a game of “spot the logical fallacies“. I certainly didn’t have the patience, but Malik Imtiaz did and wrote a blow-by-blow rebuttal of the NST interview with the de facto Ministry of Law, Nazri Aziz (See here and here). Posted by elizabethwong in "We can do better", Current Affairs, Democracy, Event, Human Rights, Malaysia, Politics. Not the politics of governance, but the politics of resistance. Posted by elizabethwong in Current Affairs, Democracy, Huh? !, Human Rights, Malaysia, Note2Self, Politics. We may have been to space and back, but something tells us that this government’s brains is permanently stuck at the *rse-end of the universe. Yesterday, Anwar Ibrahim who had given us the Lingam-Fairuz video, was served with an ultimatum by the ACA to surrender the original video by Thursday, or face jail up to two years. Yes, our very same ACA who claimed that they taught the Hong Kong ICAC a few things. Posted by elizabethwong in Democracy, Human Rights, Malaysia, Note2Self, Politics. In the present case, the plaintiff is claiming against the defendants for damages for the tort of false imprisonment as well as for the tort of assault and battery.